Mother’s Day really is special to me. Over the years, my gifts and cards have mostly all been homemade, which I love, a homemade card is much nicer than any hallmark one in my opinion. But I have never really had a ‘big gift’. This is mostly because my darling husband is a shopaphobe (it’s a word!) and obviously when they are little apart from home (or school) made gifts you can’t expect much from the kids. 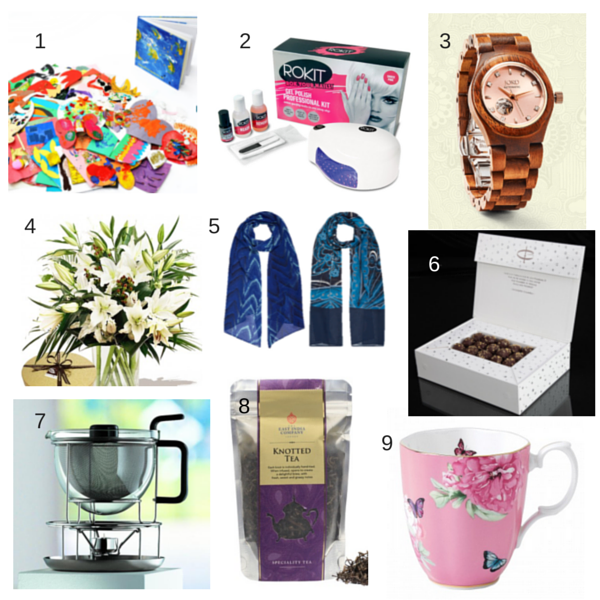 Baring in mind that a lot of other mums probably have the same experience I have I decided to put together this Ultimate Mother’s Day Gift Guide. So if you have a little more spare cash than usual this Mother’s Day, why not splash out on one of these extra special gifts for your mum? Show her how much you really care. Or buy for yourself, on behalf of the kids of course! 1. First up we have this Bespoke Children’s Artwork Book by Doodle Nest. It is quite pricey at £175 but if you are the type of person who needs to keep every single piece of artwork your child has ever made (yes I’m speaking to you!) then this might just be your answer. You get sent a box for all your artwork, Doodle Nest photograph it all, make it look bright, beautiful and blemish free, then they add them into this personalised book. 2. Secondly we have the Rokit Gel Professional Nail Kit. This is available at Debenhams for £99.99. One of the only reasons I don’t like having my nails painted is that I am rubbish at keeping them looking nice. Within the hour I usually have chips and then of course I start picking, but these gels are supposed to stay put for up to 14 days! Now my mum has her nails done every few weeks and they always look beautiful! I was lucky enough to be provided with one of these kits so keep an eye out for a full review soon. 3. Time keeping can be difficult when you have little kids running riots around your ankles but one of these beautiful wood watches by Jord could set you back between £100 and £250 (delivered from the USA) which when you think about it isn’t that steep for a really good quality watch. These really are stunning and any mum would be over the moon to receive one. I will be reviewing one of these over the next few weeks. 4. Flowers are the staple Mother’s Day gift in most houses. This luxury bouquet of hand tied, highly scented white Lilys come with a high pricetag of £119.50 but you have to agree they are a stunning display and they also come with a delicious box of chocolates. 5. Just a snap at £39 each these Colebrooke by Windsmoor scarves designed by Dame Zandra Rhodes will brighten up any wardrobe with splashes of lovely colours and designs. Zandra Rhodes was inspired by pearls, fringing and jewels when she created the designs for this collection which are bright and bold and yet still tasteful. These scarves will make any old outfit come to life. So that is it, my Ultimate Mother’s Day Gift Guide. Of course if like me, you are as poor as a church mouse, then these wonderful gifts might be a little beyond your reach, but don’t despair! Keep an eye out later this week for my more reasonably priced gift guide, some of the things will even free (or as near as i can get)! What do you have planned for your mum (or yourself) this year?